Everything since Wolf Hall has been work. Good books, work. I haven't been in a real read-y kind of mood lately... I made myself read so much to get ahead and the kinds of books I was choosing were so serious that I got a little bit burned out on books for a while. Plus, I think trying to keep up with The New Yorker (which I love, though) has cut into my book time a bit. So with this one (and the book I'm reading now) I wanted something fun. I tend to float back and forth between serious books and not. This one was not. It was just fun. This book was fun. Pure fun. It's not serious. I don't think people will remember it as an important book, but I liked it. It kept me entertained. It reminded me of being a kid, of wanting to get to the end to find out what happens, to solve the mystery. (And there's something to be said for that forward propulsion in any story, right?) It's a decent mashup of the hero's journey/quest archetype with a Nancy Drew/Hardy Boys feel to it. Set in modern day(ish) San Francisco. Google plays a prominent role. The language sometimes felt a little bit young/YA for my taste, but the characters were likable and the basic premise was, as I said, fun. So what's it about? 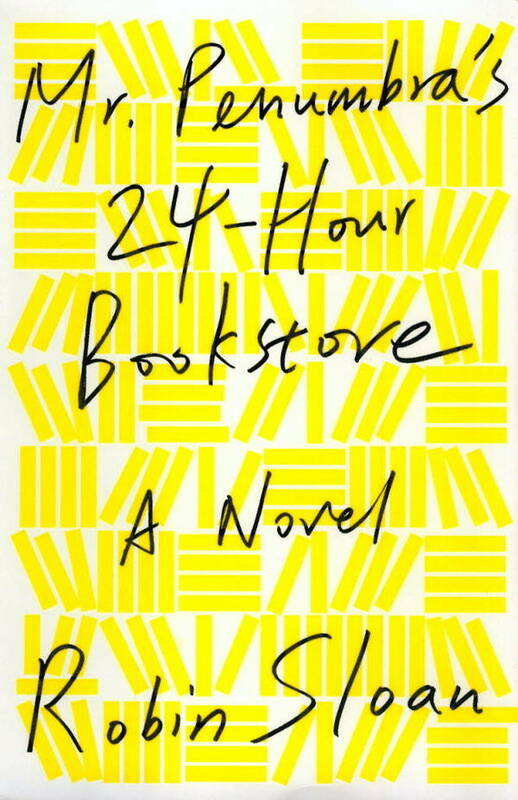 It's about an out-of-work guy, Clay, who goes to work in a mysterious 24 hour bookstore as a clerk. Soon after he begins working there, he discovers that the bookstore is connected to a secret society (why wouldn't it be?) which is connected to a maybe-cult/corporation, which is both creating code and trying to unlock even older code. He befriends a plucky young programmer from Google, and together with the quirky, literate patrons of the bookstore (who are also trying to figure out just what secrets it holds) they try to work together (and use computers!) to sneak around and unlock the great mysteries of the Unbroken Spine. Sloan is creative, and even the most recognizable aspects of the quest archetype are handled in a way that's fun to read. I'm sorry I keep typing the word fun. But I think that's the best way to describe it. Light. Playful. Happy. Enjoyable. Even though Sloan follows some canned formulas here, he did so with a wink to the genre. I was on board. My recommendation: A good light read. Nerdy, but not serious. Like a Holodeck episode of Star Trek.